Are you looking for car trailers for sale or perhaps race car trailers for sale in particular? If this is the case you’re going to want to check out Yucaipa Trailers and their massive inventory. They specialize in offering you the highest quality trailers across the US at everyday low prices that won’t force you to go out of your budget. 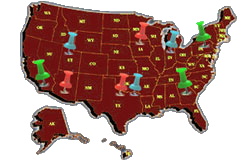 Yucaipa Trailers also has multiple pickup and drop-off locations across the country making easy to get the trailer you need when you need it. You can even contact them by phone or by using the live support option on their website when they are available. Their customer service team would be happy to speak with you. If you’re looking for a good car trailer or race car trailer Yucaipa Trailers has exactly what you need and you can check out their complete inventory online. They’re proud to say that their inventory is 10 times larger than the average inventory in the US. Their car trailers are of exceptional quality yet also incredibly affordable. Yucaipa Trailers is constantly adding trailers from new manufacturers to their inventory in order to please you and meet your needs as a customer. They always work to meet or exceed your expectations in every situation.